I have been asked to design my sister's first house and in doing the design sketches, I found myself thinking about my thought / design process in coming up with schematics for any design project. It has been over six years since I designed something (architecturally speaking). The last design project I was involved in was in 2001 before I decided to enter graduate school and work on the PhD research - albeit still within the discipline of architecture. Even though, I have been working in an architectural firm for the past two years and have been part of a design team, my role in design projects is essentially collaborating with the design architect in terms of providing essential background material for the design solution, sustainability research and clarifiying / expounding the project brief. Doing the initial schemes for the house, I was amazed at how the concepts I had toyed with the last few weeks took on a concrete orthographic form on paper. Having practiced and worked on predominantly residential projects for 10 years prior to graduate school, I was familiar with the design norms, code requirements, etc. But having been more research-oriented and on a totally different subject area in architecture, I didn't think that the commonsense 'design' rules I learned which have guided my design process and framed my methodology would come into play so naturally. Michael Surtees wrote a similar thing about his design process in graphics design, "the sketch of a logo may have only taken a moment to draw, but it took 25 years of observation to get those five seconds of inspiration". 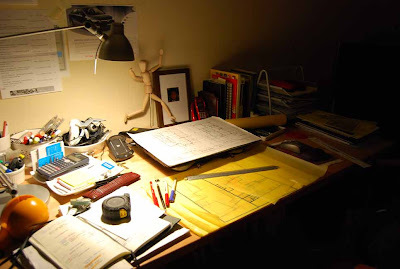 In a similar vein, recent collaboration with another design team within the practice, I was reminded of this passage from Matthew Frederick's 101 Things I Learned in Architecture School (2007): "Being process-oriented, not product driven, is the most important and difficult skill for a designer to develop ...[and] being process-oriented means [among others], seeking to understand a design problem before chasing after solutions." Perhaps a segue into another discourse but not really off on a tangent, what are these commonsense rules? How do these rules become entrenched in a designer's psyche or consciousness? Again, DesignNotes pointed to a fitting post with an education bent - from an essay by Lorraine Wild, ‘That Was Then, and This Is Now: But What Is Next?’ in Looking Closer Four: Critical Writings on Graphic Design (2002). Although refering to graphic design, Tod Roeth's How to be schooled, elaborated on the text above and is most certainly applicable to the architectural design process: "if a person wants to be the author of thoughtful, professional, and effective ... design then they must draw on their ability to exercise some real foresight, critical thinking, and common sense if they want to be ... designers." Roeth adds, "...good designers need to first be human beings with a lot of – literally – common sense. 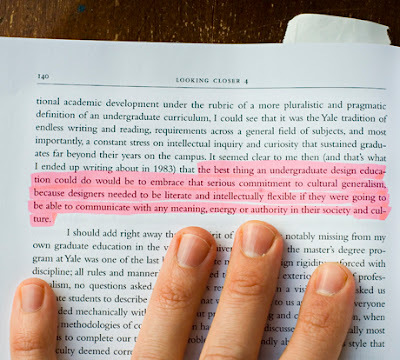 Designers need to be students of all corners of their culture’s playing field. Designers need to have a sense of business. Designers need to have a sense of politics. Designers need to have a sense of stereotypes. Designers need to have a sense of religion, philosophy, current events and history. Designers need to have a sense of urban lifestyles, agrarian lifestyles, and minority lifestyles. Designers need have a sense of conservative viewpoints. Designers need to understand liberal viewpoints." "Designers need a lot of common sense. In short, effective ... designers need to be able to be sensible and conscious of different viewpoints, and different styles of language (verbal and non-verbal) within their culture and the types of mindsets that speak them. Furthermore, ... designers then need to draw from their body of knowledge and experience, and employ it to cleverly, shrewdly, and creatively solve the problems graphic designers are challenged to confront." "And that common sense is free to all who have the passion – or at least, the wherewithal – to seek it, but priceless when obtained."